SCOTTS VALLEY, Calif. -- The Santa Cruz County Animal Shelter announced Tuesday that it has found homes for most of the 34 dogs that were found neglected at a Scotts Valley home in June. Animal shelter officers rescued the dogs on June 16 after a tip led them to the home, where they found the animals in deplorable and inhumane conditions. The officers found the dogs "stacked in airline crates in a small, dark room with no ventilation," shelter officials said. Three of the dogs, which were older and had irreparable chronic health conditions, needed to be euthanized. The dogs were not being properly cared for and were brought to the shelter to be examined by a veterinarian. Some of the medical care the dogs needed included removing rotten teeth, umbilical hernia repairs and introducing the dogs to special diets, according to the shelter. 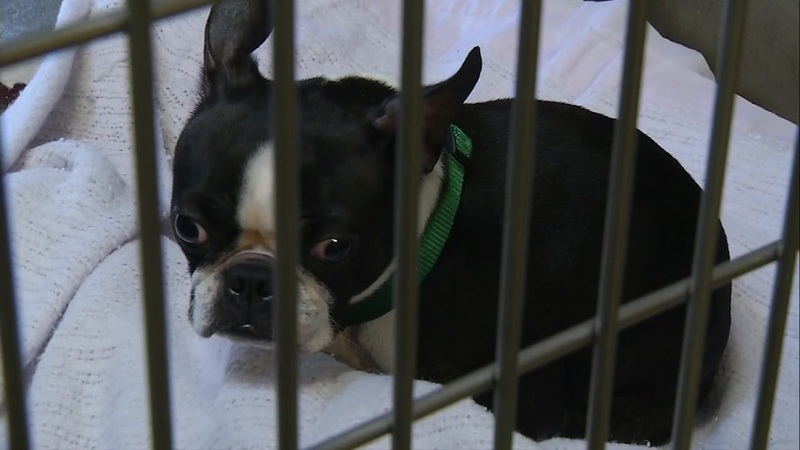 The majority of the dogs rescued were Boston terriers, while others included Tibetan Spaniels and a Chihuahua mix, shelter officials said. The Santa Cruz County District Attorney's Office is working with the Santa Cruz County Animal Shelter and the Scotts Valley Police Department to investigate the case. No update on the case was available this week. Those interested in adopting other animals from the shelter can visit the Santa Cruz Animal Shelter website or call (831) 454-7200 for more information. Click here to donate to the Extra Mile Fund.